Where do we start with this exciting, humorous and thought provoking array of contemporary art? Upon the approach to the Nottingham Contemporary Building, you cannot help but be tickled by the sight of a Running Man from the golden tower, like roadrunners infamous stationary mid-air running one could easily imagine the comical outcomes of this unexpected delight. But what is he running from, that’s for you to decide, a loan shark perhaps? Maybe he is a banker; maybe we are chasing him for our money back! This playful charm continues as you approach the entrance, the panoramic window from Gallery 2, which can be seen from inside and out, houses a gigantic set of windscreen wipers, falsifying the onlooker that it is raining all the time, which could easily be interpreted as the satirical viewpoint of Britain and its obsession with the weather…which is not too far from the truth, let’s be honest. If you leave me I’m not coming (Window Wipers) 2011. Having seen this work in the day and at night, I can honestly say it seems to be doing an excellent job of entertaining the general public with many comments from bystanders; some even start swaying to the wipers without realising. 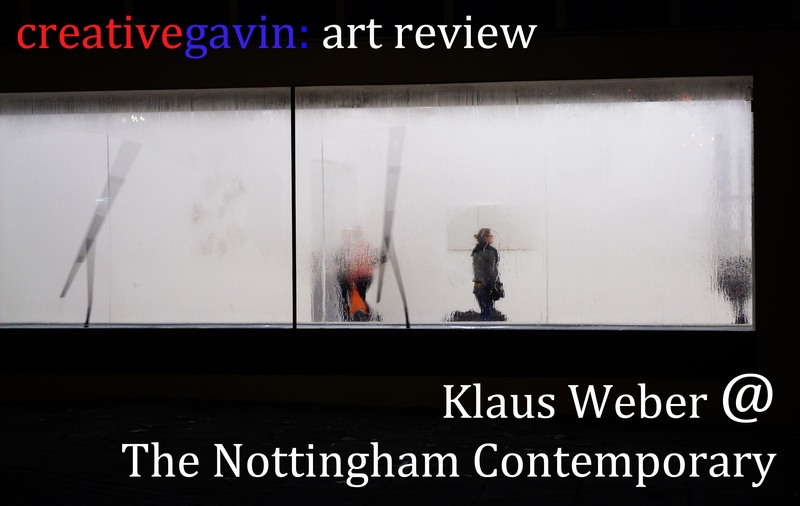 Inside the contemporary presents Klaus’s seems to be, with good reason, curated in two parts: gallery 1 and 2 presenting a more contemporary white cube space and gallery 3 and 4, dimly lit, like an Aladdin’s cave of creativity. In gallery 1 and 2, there is a contrasting yet complimentary range of works, both in scale and content. From the presentation of hundreds of Bee’s droppings on canvas (Bee Paintings, 2010/11) to a humorous yet meaningful landing of Scoria [meteor like rocks] upon a man’s tie (Untitled, Krawattenstein, 2008), suggesting that the meteor has crushed his body into the ground, maybe he had been living beyond his morels? Another major artwork within the space is a large scale chime (and I mean large! ), that sends chilling vibrations and sounds down your spine as you walk around the gallery space, creating a haunting atmosphere. Yet this chilling chime is metaphorically broken as you encounter the ironic humour that many pieces within the collection contain, itching your mind to discover more, to try and comprehend this mismatch of unsustainable emotions. I find the combination of absurdity, unexpected delight, and the discovery process of meanings behind the works all point to a feeling of pleasurable guilt. Guilt perhaps of human kinds greed, especially in the Western World. Bee populations are declining, our climates are changing [global warming], satellites are falling and political morels are changing. The contrast between the surprisingly beautiful patterns of Bee droppings with the chilling sounds of the giant wind chime demonstrating the complex and perhaps unbalanced relationship between mankind and nature. Another good example of this concept was the piece: Basteltornado (2007) which showed an installation of the creation of a mini tornado from nothing much more that a domestic vacuum cleaner, some cardboard, a bowl and a fog affect liquid pool. I’m not sure if Mother Nature would be too happy about this work? In gallery 3 and 4, there is an extensive collection of artwork, some small, some large, which have been sourced from a wide range of collections, artists and galleries, including the TATE in London. With so many works to see, there is not the time to list them all, but each and every work having its own story to tell in this cave of intriguing delights. From a rusty old Bird cage from Sussex Lunatic Asylum (1859-39) to a Bottle of Anaesthetic from the Science Museum in London, to my favourite work within the collection – A Collection of Hiking Sticks (2002): each having very unique twists, features and historical markings – almost like a spine of identity of their former owners.